Pictured The Honourable Alexandra Shackleton Principal Patron for Antarctic Endurance 2016 , Major Tony Lancashire RM (Leader and Deputy Leader of the project) and Cdr Tim Winter FRGS RN at MOD Main Building. 24/2/14. My father was Ernest Shackleton’s youngest child Edward, who became Leader of the House of Lords. I was Sponsor of HMS ENDURANCE for 23 years and I am currently Sponsor of the BAS ship RRS Ernest Shackleton. I have been to the Falkland Islands 8 times, South Georgia 3 times and the Antarctic 4 times; I am a member of associated committees. I have spoken in many countries on Shackleton’s leadership and been Patron of several Polar Expeditions. I am confident that Antarctic Endurance 2016 will make me a very proud Patron indeed. Pictured The 1st Sea Lord Admiral Sir George Zambellas KCB DSC ADC, Major Tony Lancaster RM (Leader and Deputy Leader of the Antarctic Endurance 2016 project) and Cdr Tim Winter FRGS RN at MOD Main Building. 24/2/14. I salute the ambition of Exercise Antarctic Endurance 2016. It is a project which will inspire, celebrate and educate. Sir Ernest Shackleton is, without reservation, my personal leadership model because of the way in which he shaped the success he achieved, and this venture is a fitting tribute to mark the centenary of his team’s heroic exploits in the Antarctic. Not only will this expedition provide its participants with a once in a lifetime experience, but it also aims to give a new generation of sailors and marines the thirst for adventure on land and sea. And the research it conducts into team dynamics and performance will also be used to inform the training and through-life development of personnel serving in today’s Royal Navy. All of which means I am delighted to be the Senior Service Patron for this imaginative, valuable and unique expedition. Lieutenant General Gordon Messenger DSO* OBE RM a Patron for Antarctic Endurance 2016, with Commander Tim Winter FRGS RN and Major Tony Lancashire RM (Leader and Deputy Leader of the project) outside MOD Main Building. This is the launch of a 3-year project standing on the shoulders of Shackleton to conduct research into team dynamics, centred on a 6-week sailing and mountaineering expedition to the Antarctic and South Georgia by the Naval Service. Ex ANTARCTIC ENDURANCE is an exciting, ambitious project which embodies the qualities we expect of our young sailors and Marines. 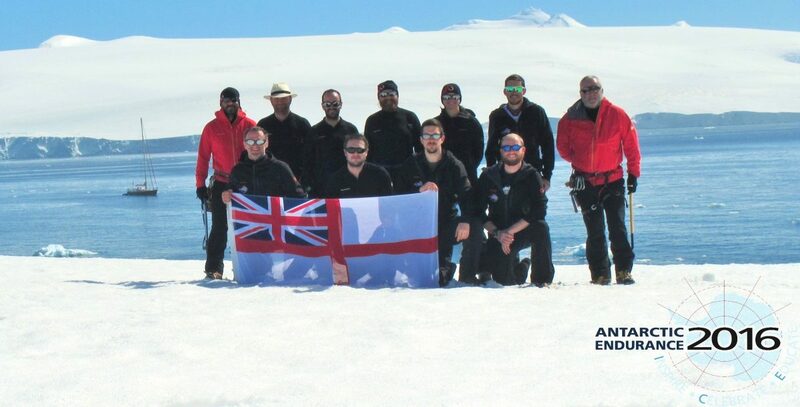 Combining risk, adventure, determination and teamwork with respect for the Antarctic environment and its rich history, it will be an outstanding opportunity for the selected few. I am delighted to support Exercise Antarctic Endurance 2016. The team will push themselves to the limit, sailing and mountaineering in the most demanding environment for both disciplines. The more experienced will pass on their knowledge to the more junior, on an expedition that will test them all. Pushing to the limit and managing that risk is what we do, and this expedition is bound to test all team members to the limit. Good luck. The Honourable Alexandra Shackleton meets some of the team onboard Xplore while alongside HMS PRESIDENT in June 2015.